Obituary – Milliron, Jimmie LaVern « Perry High School Alumni Association, Inc.
Jimmie L. Milliron, 76, Arkansas City, died Friday, June 25, 2004, as the result of a vehicle accident. Funeral services will be at 2 p.m. Wednesday, June 30, 2004, at the Central Christian Church with the Rev. Steve Chambers officiating. Interment will follow in the Parker Cemetery. The casket will remain closed at all times. The family will greet friends at the funeral home from 6-8 p.m. today. Born June 12, 1928, in Perry, Okla., he was the son of Arthur and Wilna Mae (Cowell) Milliron. 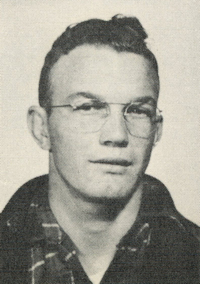 He was reared and educated in Perry, graduating from Perry High School in 1947. He also attended Northern Oklahoma Junior College of Tonkawa. Jimmie later served in the United States Army during the Korean Conflict. He was stationed in Fort Carson, Colo.
On March 17, 1956, he married Dorothy Bailey in Perry. The couple lived there for three and a half years before moving to Fort Morgan, Colo., where they lived until December of 1976, when they moved to Arkansas City. Jimmie worked for the Pacific Pump Company of Perry and was later transferred to Fort Morgan. While at Fort Morgan, he later became a field representative for the Republic Supply Company. He retired from Republic in 1986 after 30 years of service. After his retirement from Republic, Jimmie worked for the Pioneer Seed Company for a short time. Jimmie was a member of the Central Christian Church. Survivors include his wife, Dorothy of the home; three sons, Todd Weldon Milliron of Yorkville, Ill., Douglas Kyle Milliron and Lance Miles Milliron, both of Arkansas City; three brothers, Virgil of Oklahoma City, Darrell of Watonga, Okla., and Robert of Erie; one sister, Carol Walls of Huntsville, Ala.; and seven grandchildren.